This is a glorious wide-angle photograph of a wedding ceremony at the famous Saint Louis Cathedral in New Orleans, capturing the beauty and splendor of this historic landmark. Though there has been a Catholic presence at this location since 1718, most of the present structure was built in 1850. All ceremonies in the iconic Cathedral are awe-inspiring, but this wedding was made even more impressive with the addition of a tympanist accompanying the traditional organ and trumpet music during the processional, making for a much more dramatic and breathtaking entrance for the bride and her father. This is without question the most in-demand venue for Catholic wedding ceremonies in the New Orleans area, so if you dream of getting married here, especially on a Saturday in the busier months during Spring or Autumn, you must secure your date very far in advance. This particular event was spectacularly coordinated by Leslie Campbell Weddings. 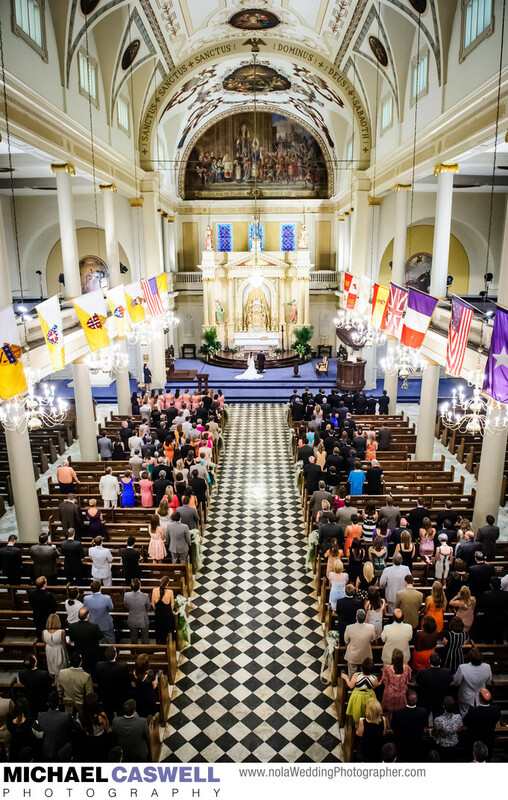 This historic church, with its central location in the French Quarter, has numerous outstanding reception venues within walking (and second lining!) distance. Located nearby are Pat O's on the River, The Jaxson, Riverview Room, Latrobe's, Muriel's on Jackson Square, and a variety of elegant hotels such as the Omni Royal Orleans, Monteleone, Bourbon Orleans, and Royal Sonesta. And, of course, you can always opt to arrange transportation for your guests if your chosen reception facility is not nearby. One thing to be aware of is that in almost all cases, this church does not allow time after the ceremony for formal group photographs. So, you either need to plan to have a first look and do all these photographs before the ceremony, or do them at the reception venue afterward. Another option is to do the group shots in Jackson Square before or after the ceremony (assuming the ceremony ends before the park closes), though you do need to obtain a Jackson Square photography permit from the New Orleans Department of Parks and Parkways for this, as the requirement is actively enforced by park maintenance personnel. It's also important to note that the permit does not grant you exclusive use of the park, so it's usually unavoidable that there will be some bystanders in the background of these photographs. In some cases, we can use Pirate's Alley, which is right next to the Cathedral, but again, it's almost impossible to avoid capturing a few unintentional photobombers in the background. Many couples don't have a problem with this, and consider it to just be part of the ambiance of their New Orleans wedding day! But if you want perfectly clean backgrounds in the formal group shots, plan on making arrangements for a different location.